This guest post is written by an anonymous leader in NC. Being a Young Life leader pushes us to come out of our shell. To break away from our comfort zone. To step into the darkness. I knew all of this when I started leading a few years ago, and while I am well aware that I could do better in all of these aspects, I’ve always been remotely willing to go where God has led me. Today, though, for the first time, I felt a crippling fear that I had no idea still lived within me. I’m reading a book that I got as a Christmas present about mission work in Africa. A 19 year old girl picked up and “quit life” and is doing some pretty spectacular things over there. Obviously, I felt convicted about my life and my deeds that seem so small and unimportant in the grand scheme. Driving home after overnight babysitting this morning, I was praying that God helped me see Him in my everyday life, rather than assuming He is only present in African missions. Kind of stereotypical, right? I prayed “Lord, give me a path to follow so I can choose to see You and say ‘yes’”. Well I got it. All of a sudden, I heard a voice that said “Go to the high school.” That’s it. Easy enough, right? I mean, I am a Young Life leader after all. As I was driving, I gripped my steering wheel and kept my focus straight. The high school was literally 2 minutes away on my left. I was in the right lane. I literally thought of every single stupid excuse not to go there. My gas light was on, so that’s the final excuse I used. I pulled into the gas station and sat—livid at myself for turning right instead of left. I filled up my tank. I still had time to go to the school. “I’ll go tomorrow morning AND Friday for lunches!” Why was I so afraid to go this morning? I was feeling 100% convicted but doing nothing about it. Alright. I’m going to go. Driving into the parking lot, I parked at the back. I was still deathly afraid. Why? Tears started rolling down my cheeks as I questioned if I should even be in this ministry. I pulled out my journal and started writing. I asked myself one last time what I was afraid of and my answers came so easily: Rejection? Yes. Not following God’s plan for my life? Yes. How both God and other people will perceive me if I’m not living up to their standards? Yes. I am afraid of my inadequacies. Can I do this? Not without God. Am I willing to do this? Obviously not without God. Then I did what any soul searching leader would do. 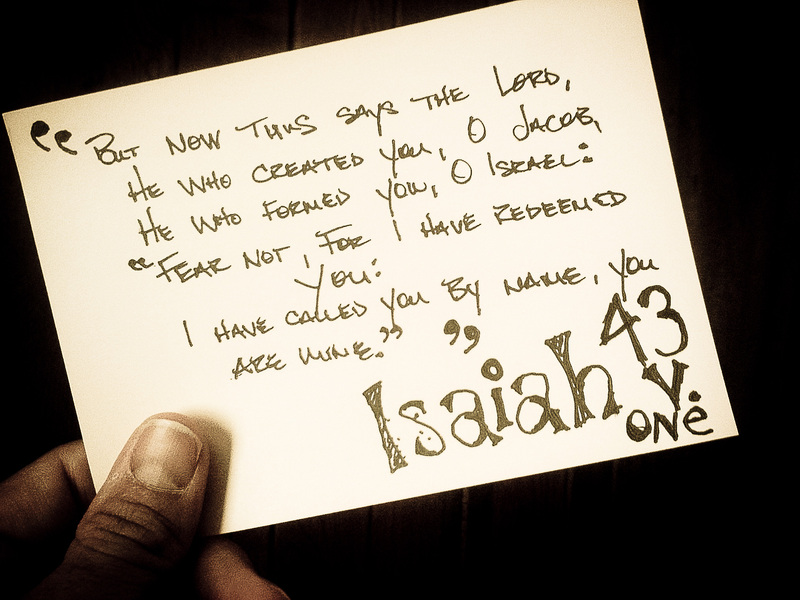 I opened my Bible to Isaiah 43. Remember the song you sang in Youth Group? I sang it in club, but we don’t anymore—I should really fix that. I read it and immediately started crying again. Why am I fearful of the greatest Being that REDEEMED me? He called me by my name—because he loves me. God told me to go to the high school. After fighting tooth and nail, I got there. And I am fine. The waves of high school students didn’t sweep over me. The fire of teenagers’ glares didn’t set me ablaze. It is so easy to feel inadequate in ministry…Especially this ministry. That is why it is imperative to focus on how the Creator created us: In love. Redeemable. For His pleasure and delight. Don’t be like me. Listen to His words the first time. I almost missed out on the sweet time sitting in a high school parking lot, having sweet, sweet conversation with my Savior and praying for my friends. He loves me so much. The last thing he wants me to feel is afraid. Thanks for sharing this! It is a great reminder that we all struggle with fear and feelings of inadequacy...but that He loves us, He has redeemed us, and He has called us by name. Let us know about a time you heard God speaking to you and how you responded. Here's how you submit a guest post. Led Bicycle Light is more efficient as compare to normal bicycle light. It can be use over a long period of time with charged battery.